Last month, Chef Phillip Frankland Lee caused a positive stir in my industry by announcing that he would offer any back of house (BOH) employee a free six-course tasting menu throughout the month of February and 50% off for any accompanying guest or additional food ordered. This meant a lot to line cooks like me who make little money (or took a severe pay cut) in order to pursue their passion in the culinary field. He called it Back of House Appreciation Month and boy did I feel appreciated! Our romantic date night started off with drinks: Martin had the Piraat Belgian ale, which reminded him of his favorite Trappist ale, Chimay. I selected the Supplies! 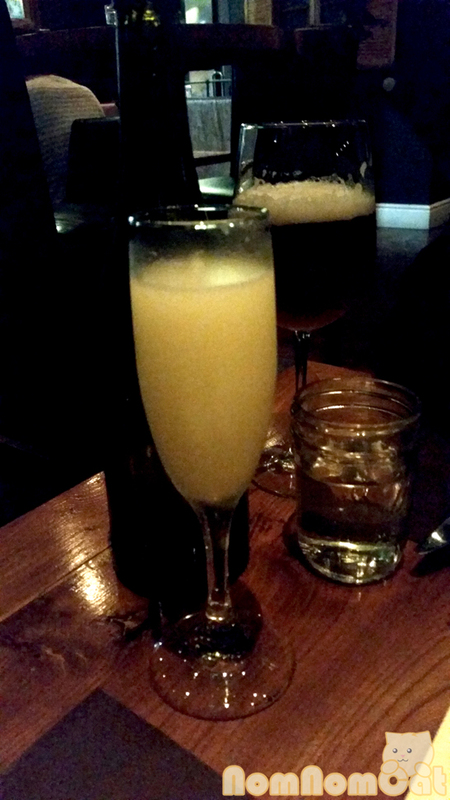 – a cocktail of unfiltered sake, pineapple, and lemon. It was so good that I had two. It was so refreshing and reminiscent of something I’d want in my hand as I lay out tanning by a pool. Scratch|Board – smoked goat cheese, gravlax, air dry cured beef, pork pate, beet dijon, prunes, pickled onions, house sourdough. 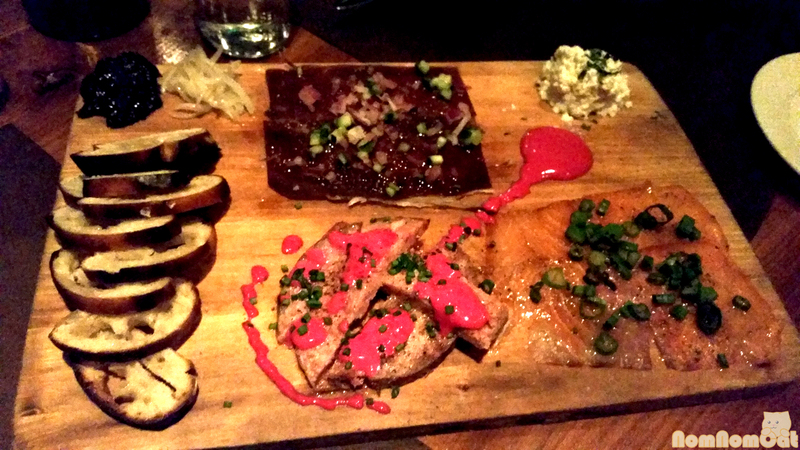 The pork “pate” was SO GOOD. It was not a country pate but rather bore more resemblance to the headcheese terrine i made during my time at Waterloo & City. And the beet dijon? Our server Mark phrased it profoundly accurately — “The beet dijon is money!” Get this. 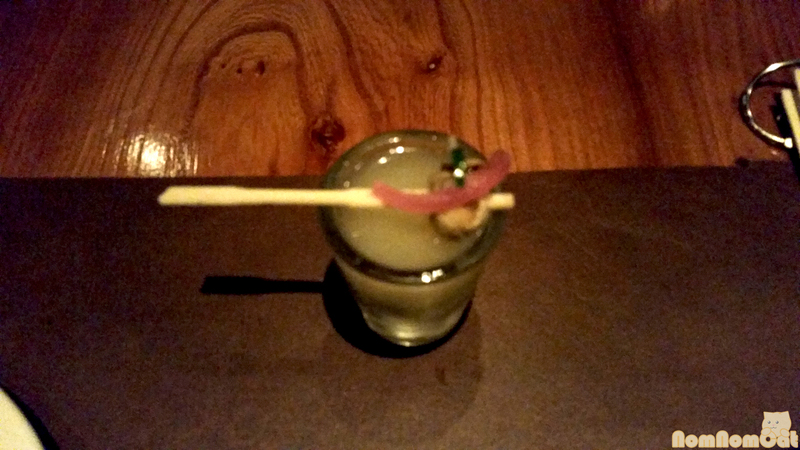 Course 1: Green Mussel and Sea Urchin Sake Shooter – I usually don’t like being told how to eat my food, but this shooter was a fun exception. First, eat the pick with ceviche green mussel, pickled onion, and serrano. Then, shoot the unfiltered (nigori) sake and lemon. Finally, spoon out the uni and avocado mousse at the bottom. Delicious! Course 2: Pork Belly & Raw Oyster – braised (?) pork belly topped with raw oyster and coconut-chamomile foam with chamomile dust. This single bite was a surprisingly hearty rendition of surf & turf. 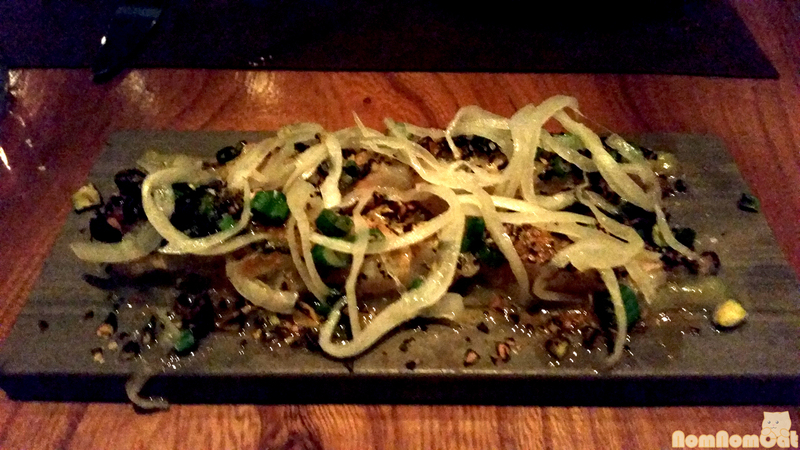 Course 3: Roasted yet Raw Prawns – raw prawns topped with a lime and fish sauce (?) vinaigrette, toasted nuts, and shaved smoked white onion. It tasted exactly like the meat served in the Vietnamese vermicelli bowls (bun thit nuong) that I grew up eating. The super charred nuts gave the dish a pleasant “roasted” flavor even though the shrimp themselves had not been cooked at all. 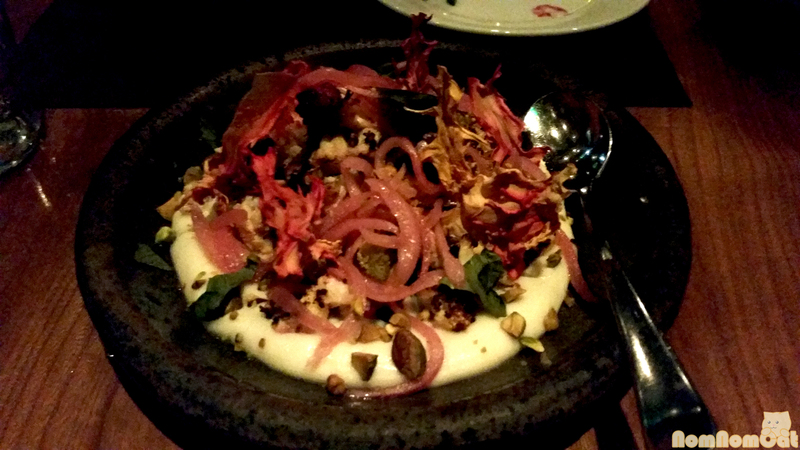 Course 4: Blackened Cauliflower – cauliflower puree, roasted cauliflower, lemon, chip made from cauliflower stems. This dish is 100% vegan which is unbelievable because the puree tasted so rich and silky that I thought it had to be mounted with obscene amounts of butter and/or cream. Martin loves cauliflower so this homage was perfect for him. We were pleasantly surprised to find bits of romanesco in there as well. 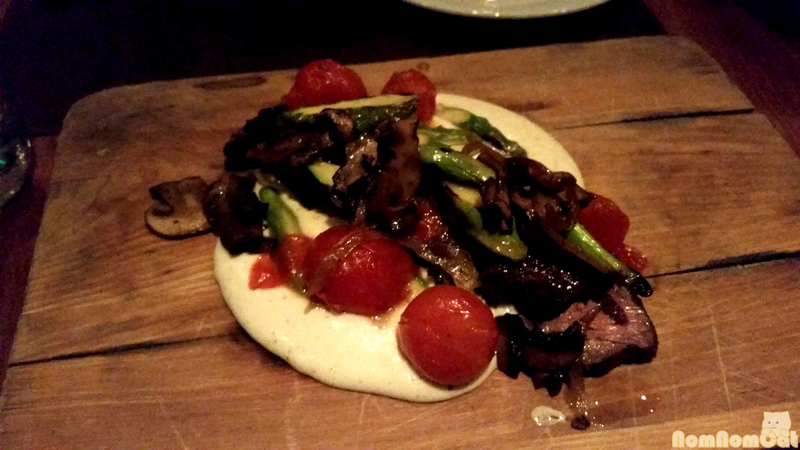 Course 5: Prime Hangar Steak – mashed potato puree, roasted asparagus and mushrooms, sugar blistered cherry tomatoes. OMG THE TOMATOES. So freaking sweet and juicy. This puree was smooth and decadent as well, though with the help of animal fat, and the steak was a perfect medium rare. 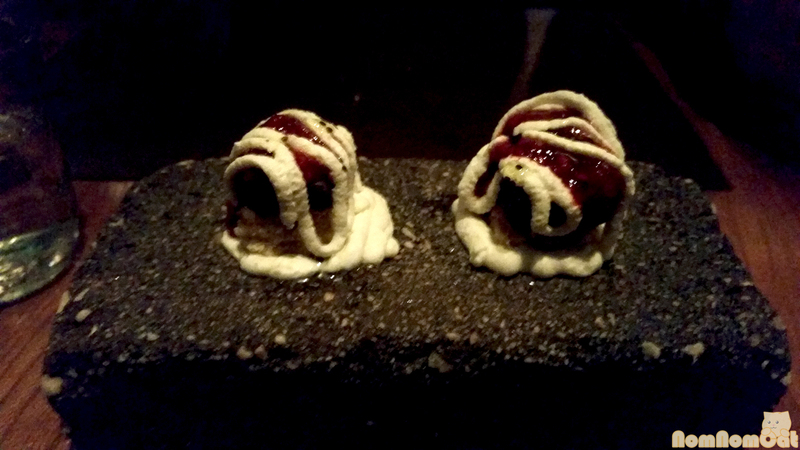 Course 6: Dark Chocolate & Cayenne Candy Bar – sugar cookie, cayenne-infused dark chocolate, raspberry jam, house made whipped cream, chia seeds. The cayenne aroma was intoxicating and I was worried it would be too spicy for Martin, but the spice was barely perceivable on the palate. Beautifully composed. At this point, Mark came back to our table to see if we wanted to order any additional supplements. “Didn’t we just have our dessert?” I teased. 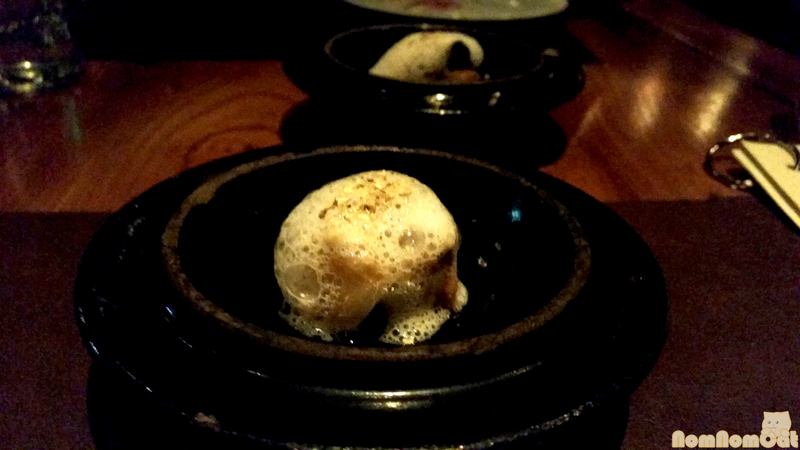 As if he had read our minds, that’s when he pointed out the savory-but-sweet foie gras s’mores. Why not? 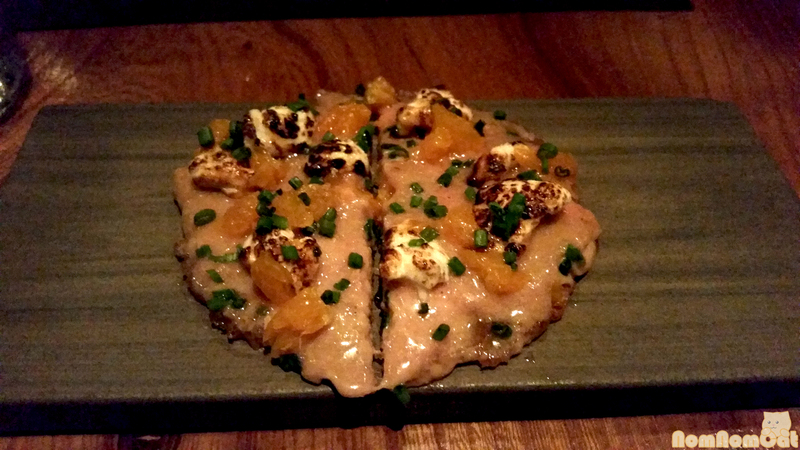 Foie Gras S’mores – cinnamon-nut “graham cracker,” seared foie gras, house made marshmallows, tangerines, tangerine vinaigrette (? ), chives. Sweet, savory, sour, bitter, plus just the right amount of fatty (I know that’s not one of the “tastes”). Sure it’s not a conventional dessert but it was still a worthy way to end our meal. Thank you again to Chef Phillip Frankland Lee for this opportunity to spend $100 on a dinner that would have easily cost (and rightfully so) $200-300. It was a dinner that we will not soon forget.